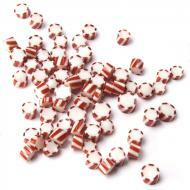 Murrine, Peppermint Twist Pack, .5 oz. Bullseye Murrine are designed with kilnformers in mind. The .5 oz. bag contains approximately 60 pieces ranging from approximately 1/8” to 3/8” diameter and 1/8” thickness.